I haven't really shared much on this, so the new forum seemed a good place to do so. The Bund bible, Konrad Knirim's book, contains all the information about this, but in case you can't be bothered, here are a few titbits. It is made by Helmut Tengler of Pforzheim, a maker that I personally have not heard of before or since. Only 500 ever made and issued, there is some didcussion over how many "prototypes" were also made that do not have one of the 1-500 serial numbers (mine is 14*), but general agreement is that it is less than 50. So at a total of <550 examples, this makes it considerably rarer than the other Bund 5100s, the PD, Arctos and Tutima. Only the Tutima "general's chronograph" is rarer, I have never seen one of those, posted, for sale or anywhere. I have always wondered whether this unicorn was produced only as a one-off thank you by Tutima to the general who gave them the Bund contract, but I digress. It was produced for the artillery, and originally issued in a large folder with star map and other navigational aids included. Examples that still retain this folder are extremely rare indeed. These are often confused with the Arctos Bund, which uses the same case. However, there are clear differences, not only on the caseback. Notably, the Tengler uses white hands with a lume centre, rather than solid lume ones. Also, the 24-hr hand on the Arctos is a needle hand. The dial differs in the Arctos has single second indices on the constant seconds sub-dial, and 30-minute markers on the 12-hr chrono sub-dial. The 1-12 chapter ring on the Tengler is also different, using a different typeface with silvered numerals. All of these changes render the Tengler just a little better to look at (imho) than the Arctos. It seems the Tenglers were not very well treated when de-commissioned. It is generally thought that the Quartermasters (or technicians) were given free hand to "improve" their condition prior to sell-off. As a result, they are generally subject to some rather random re-finishing, almost always brushed circumferentially on the case front and linearly on the sides. Some owners have clearly not liked these rather amateur efforts and have had their examples re-finished, some even being blasted. I am glad mine retains its original finish, even if it is a bit agricultural. The Tengler is only 50m waterproof, which is interesting as everything else that uses the same case is rated to at least 100m. The Tengler has a screw-down crown as standard too, so I have wondered why they were so conservative in their rating. Here it is again - see if you can guess what the background is in this photo?? This is my one and only issued watch, at the moment, and one of the best, given my collection's focus. A wonderful rarity - I was wondering when it was going to make an appearance here! 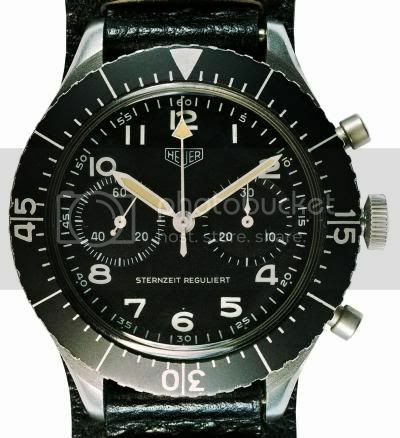 Is this watch set to sidereal time like the earlier Heuer SG 1550 Sternzeit Reguliert? (According to Konrad it was issued with the same leather wallet and star charts etc). (Just in case anyone wonders, sidereal time is the time required for the Earth to rotate once on its axis relative to the stars. This occurs in 23 hours 56 minutes and 4 seconds of ordinary mean solar time. A sidereal day consists of 24 sidereal hours. The sidereal day starts when the Vernal Equinox crosses the Greenwich Meridian. For the boffins, this means that sidereal time is equal to the Hour Angle of the Vernal Equinox). This Tengler is another watch I am looking forward to seeing tomorrow at the GTG. Last edited by StampeSV4; 25-11-2009 at 17:36.